Put away your pens and paper, because the makers of the iPhone's most popular games don't want anyone else doodling. 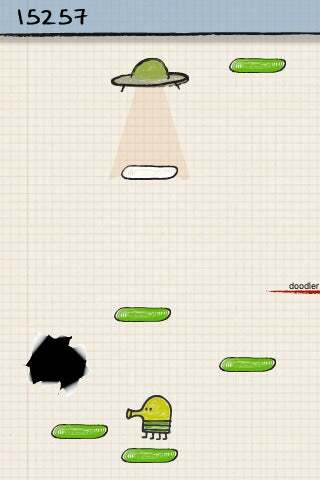 Doodle Jump from Lima Sky is a regular in the top ten on the Apple App charts, but it's not the first iOS game to have "doodle" in it. However, other developers are claiming that Lima Sky is trying to muscle them out from using the word "doodle" in their game titles. The developer behind Doodle Monster, no relation to Doodle Jump, was notified by Apple, it seems, because Lima Sky was apparently saying the title was copyright infringement. Doodle Monster's developer changed the game's name and decided to move on. "We can't really debate it," Doodle Monster's developer said. "In the Apple world they can pull your app from just mere implication. There is no proving right or wrong." Lima Sky doesn't apparently doesn't have the trademark for the word "Doodle", but does for "Doodle Jump". And there are currently over 700 Apps with the word "doodle" in them. "We are not claiming ownership of the trademark for 'doodle'," Lima Sky told website PocketGamer. Instead, the developer said it is policing its trademarks. It seems to be the combination of "Doodle" plus another word that is causing the fuss.